While we think of sixties and seventies TV cops as sophisticated post James Bonds, Frank Marker, who was played so brilliantly by Alfred Burke in the sixties television series PUBLIC EYE was no Simon Templar, Jason King or John Steed, I can tell you. Marker had a lot more in common with the character that Richard Burton played in the film The Spy Who Came In From the Cold or Edward Woodward’s Callan. In fact Marker is almost an amalgam of Callan and his occasional side kick Lonely. The Public Eye ran for 10 years –from 1965 to 1975- with almost 100 episodes and although I haven’t seen it since then I remember it quite well and very fondly. Marker moved from a dingy office in London to another flea pit in Birmingham and eventually to Brighton, and I can still picture him walking along a wind and rain swept sea-front, looking like someone from a Morrissey song. Marker looked like a soggy mongrel and he was a walking hard luck story, getting knocked about by the police as well as criminals and even being framed and sent to prison. 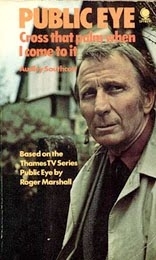 Alfred Burke died on 16 February 2011 aged 92. A nice tribute, Paul and thanks for that. I remember Public Eye and Frank Marker fondly. I will search this show out at some point in the near future. It wasn’t shown on American television when I was growing up and have never seen it. But if it resembles Burton’s performance in SPY then I would enjoy it. Very nice, Paul! I feel as though I have missed something rather good… I actually caught a bit of The Spy Who Came In From the Cold, while visiting a friend some years ago… a very interesting character.